Joseph Carroll's ingenious idea is to attach a tether from the crewed Soyuz spaceship to its final stage - and use this as a counterweight to do the first ever real experiment in tethered artificial gravity. He has found a way to do this without using a drop of extra fuel. Both are in orbit already. When astronauts go to the ISS, the final stage of the Soyuz FG launcher (which still contains the crew at this point) first goes into a low altitude orbit between 200 and 242 kms in altitude . Then the Soyuz TMA with the astronauts o board separates, and accelerates up to the higher orbit of the ISS (at 413 to 417 kms). His proposal is to do the tether experiment at this moment of separation, before the TMA accelerates up to the ISS. These artificial gravity experiments could help explore ways of solving zero g health issues for long term residence in space and interplanetary flight, and can also be used to explore effects of low gravity on human health. Simulated view of the TMA spacecraft as it separates from the third stage booster at an altitude of 200 km (click to see it higher resolution). At this point the booster and the TMA are both in orbit around the Earth at this altitude. Joe Carroll's idea is to have a tether between these two components. Soyuz TMA spacecraft after separation and deployment of its solar panels. NB, there's a detail to be sorted out here - do you deploy the solar panels before or after the tether experiment? If deploy before the experiment, their supports need to be strong enough to withstand the artificial gravity - this is probably easier if the solar arrays are orientated radially to the axis of rotation during the tether spin. This is best if possible as then you have no power limitations for the experiment. If you leave deployment of the arrays until later - it is a case of how long you can manage without external power for the experiment. You'd be dependent on the storage batteries for power. Early Soyuz spacecraft before the solar power systems had 2 days of battery power. Not sure about the TMA. His idea is to pre-attach a tether between the Soyuz TMA and the final stage of the Soyuz FG launcher. They remain tethered after separation. Then, instead of boosting straight to the ISS, the Soyuz TMA boosts at right angles to the tether. This spins up the whole system, generating artificial gravity. This sounds like a huge waste of fuel, to put your acceleration into spinning around a tether when you want to go to the ISS. But the clever thing about his idea is that you can recover all of this for free, when you finish the experiment. What matters is the delta v - the amount of extra velocity you build up. Although the capsule turns in a circle around the center of gravity of the system, it still builds up the same amount of extra velocity. You would do the spin up using pulsed posigrade burns - so in the direction of the orbit - so that as well as spinning it up, they also increase rather than reduce orbital velocity of the entire tethered system as well as increasing the velocity around the centre of gravity..
Then, you keep spinning by conservation of angular momentum, and keep your extra delta v, until the time comes to separate. So there is no urgency to separate. When the time comes, all we need to do is to cut the tether at the right moment in time, and it will fly away (like a stone flung from a sling) with the right amount of delta v to reach the ISS. This experiment is limited in duration only because of the low altitude. It's low enough so that you'll re-enter after a few days if you stay there. Here is a video of one of the Soyuz third stage boosters re-entering the atmosphere three days after it went into orbit, in 2011 over the Netherlands. This video shows the re-entry of one of the third stage boosters for a Soyuz launch to the ISS - a particularly dramatic one since it happened over a highly populated area of the world - the Netherlands. See also Best video of Soyuz rocket burning up so far - and Breaking News: Decay of Soyuz r/b stage from André Kuipers' launch to ISS observed from the Netherlands! Normally the TMA accelerates to get enough delta V to reach the ISS, while the booster is gradually slowed down by the drag of the fringes of the Earth's atmosphere, and re-enters after a few days. If you stay at that orbit for long enough eventually you re-enter. But you could do at least many hours of artificial gravity using the tether system. . The whole experiment is very safe as you remain a couple of hundred kilometers below the orbit of the ISS throughout. There is no risk of hitting it. When the time comes to finish the experiment, you cut the tether at just the right moment in the spin. As a bonus, you can also do a controlled re-entry of the upper stage by choosing when in the orbit to cut the tether (you'd probably do this so that it re-enters over the Pacific, usually considered best place to de-orbit space debris). The crew capsule departs in the opposite direction, with just the amount of delta v needed to reach the altitude of the ISS. You can use the same idea of a tether to the final stage booster for other launches to orbit, e.g. for SpaceX once it has crewed launchers. You can extend the experiment, of course, if you have some extra fuel, by boosting the spaceship + tether into a slightly higher orbit before you start the experiment. For details see Joseph Carroll's paper, and his presentation. You can hear him describe it on the Space Show here. The only previous missions anything like this are Gemini 11 and 12 in 1966 - but those generated such a tiny amount of artificial gravity that the humans couldn't feel it - and lasted for just half an hour, and was a test of tethered station keeping rather than artificial gravity. For more about this, and the motivation for these experiments, see Can Spinning Habitats Solve Zero g Problem? And Answer Low g Questions? You don't need to use all the fuel at once. By burning just some of it, you can test low levels of gravity and slow spin rates. Then gradually you can increase the delta v, so you can test higher levels of artificial gravity with higher spin rates. 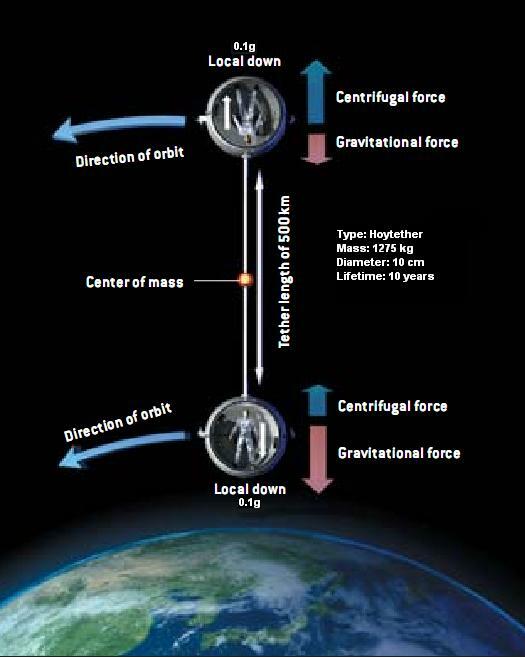 You can change the tether length at any particular delta v, to try different spin rates and levels of artificial g. However, the one thing you mustn't do is to decelerate to reduce your velocity around the centre of gravity, as this would waste fuel. As you test higher spin rates, you might find it gets too uncomfortable for the astronauts. If so, that's no problem as you can let out the tether to decrease the spin rate (this also reduces the level of artificial gravity). If you need to break off from the experiment earlier than expected (perhaps because of astronaut discomfort even at the slowest spin rates available), that's fine too. You still recover all the delta v you put into the system so far, and then can continue to boost as normal until you reach the altitude of the ISS. Health effects of low gravity - do you need full gravity to stay healthy, or is partial gravity okay - or even (as some suggest) better for health than full g.
Whether the centrifuge experiments on the ground accurately predict human tolerance in space - and use the experiment to refine our models if not. Since humans may well be able to adapt to faster spin rates over periods of days, weeks, or months, then we certainly need to do longer experiments later on. This experiemnt might also help astronauts to adapt to zero g, and avoid zero g nausea. If so, it might become routine, to spin for a few hours at low g rates on the way to the ISS. Based on the data from these experiments we could design habitats with artificial gravity for long term residence - and tether based spacecraft for interplanetary travel. Designs could be made smaller if it turns out that humans can tolerate faster spin rates - or larger if they are extremely sensitive to even small spin rates. Current designs are based on hypotheses and theoretical models only, with no data from humans in space. The low gravity experiments would also tell us whether various levels of partial gravity are as bad for health as zero g, or in between zero g and full g in its effect, or perhaps at some levels of partial gravity (as some suggest) better for health even than full g.
We could find out also if low gravity is sufficient to keep a crew healthy for long periods in space (e.g. many years) or if full gravity is required. For more about this see Can Spinning Habitats Solve Zero g Problem? And Answer Low g Questions? This would complement research on small arm centrifgues in space (article on this coming soon). This is more of an issue for later stages when you have long term tether experiments at higher orbits (where there is more debris). But one might as well use a robust tether right from the beginning. You can deal with the problem of orbital debris using a fabric or multiple cable type approach. Here is a fully worked out proposal for a tether using multiple cables connected together with lots of short sections so that even multiple breaks of all the tethers won’t damage integrity of the whole system. The author works out that the Hoy tether would have a 100 year lifetime for a 290 km tether weighing 6700 kg in the LEO environment of space debris. So – that’s solvable, don’t need to clear LEO of small debris to have a tether system. If you can manage 290 km for 100 years can certainly do a few hundred meters. You probably don't need to do much by way of maneuvering in the low 200 km orbit of the Soyuz third stage. For one thing, there's not so much debris there (it will quickly decay and fall back to Earth). But in a permanent tethered craft, you might well want to maneuver it to avoid space debris. You also need to maneuver on interplanetary flights, e.g. for flybys. It would be a nuisance if you have to despin it first - or worse, cut the tether. However, it turns out that you can accelerate and decelerate without needing to despin. This also means you can move a spinning tethered habitat in LEO to avoid debris, as with the ISS with no need to despin first. Indeed would be good practice to do it in LEO first to develop the system you’d use for the course changes for a Mars mission. For that matter, not only can you maneuver. If you work out the direction of your rocket thrusts carefully, you can also keep to the same levels of artificial gravity throughout the course change. The key to this technique is to thrust askew of the centre of gravity of the system. Just thought I'd mention this, in case any of you worry that if, on a remote chance, the tether breaks, the two parts of a tethered satellite would fly apart and one part might hit the Earth. This won't happen, because the speeds of habitats connected to each other with a tether system for artificial gravity are measured in meters per second. To de-orbit, then you need speeds of the order of kilometers per second. The way it works is, if for instance you threw a ball from the ISS towards the Earth - then you do indeed give it extra momentum in the direction of the Earth. But because you are in orbit, then this extra momentum first sends it towards the Earth, but half an orbit later, you find it sends it away from the Earth again. The end result is that it goes into a slightly different orbit from the ISS, crossing its orbit every so often. To get it to hit the Earth you'd need to throw the ball backwards along your orbit at about 22,100 mph. This would stop it in its tracks and it would then fall to Earth under gravity. So similarly if the tether breaks, all that happens is that the two components go into different orbits and if they have some spare fuel, can easily re-attach. So, it's more of a nuisance, if the tether breaks, than a serious issue. You'd lose your artificial gravity of course until you can rendezvous with the other habitat, fix a new tether and spin up again. Later on though, you might use the tether in other ways, for instance as a tube to get from one part of the tether system to another, and might eventually develop it into an extension of the habitat (e.g. with greenhouses, lifts to get from one module to another, zero g habitat in the centre and so on). It would then of course be more of a serious issue if it broke. Given that you can engineer the tether to be safe from micro-meteorite then the ability to break it can be an asset as an abort scenario for a mission to Mars, if you set it up right, break it at the right moment and your spacecraft gets sent back to Earth immediately when you get to Mars. Here is a paper about that idea: Artificial gravity and abort scenarios via tethers for human missions to Mars. You could also use it in a similar way in as a last minute "emergency release" to escape some imminent piece of debris. Suppose you are in a tethered space station and see a large bit of debris heading your way, too late to do anything about it. Or indeed, a natural meteorite also. You can cut the tether, and you will instantly speed out of its way at many meters per second, without any need to do rocket boosts, and the only result is that you lose your artificial gravity until you can connect back up again. Space debris cloud, from the NORAD data - shows the two main regions of debris, in LEO and in geostationary orbit. There might be other ways other than tethered and linear acceleration for spaceships close to a planet or other large gravity gradient. First of all, far future, the space elevator – then at far end would get full g with head towards the Earth – and 24 hour rotation as for on Earth – that’s like a half length tether, because Earth is so much more massive. At the end closest to Earth, you experience gradually reducing gravity as you go up the tether. The space elevator, if it is ever built, would give you partial, full, and hyper gravity all with spin rates of one rotation per day. Materials aren't yet quite strong enough to build it because of the length of the cable, much of it under full gravity. Most materials are strong enough to hold up at most a few tens or hundreds of kilometers of cable of the same material at under gravity. Carbon nanotubes would be strong enough (just) but we can't yet make them even meters in length, certainly not yet thousands of kilometers in length. But also there’s an intriguing idea – to use the Earth's gravity gradient, and the way that satellites naturally orientate themselves towards the Earth. Gravity falls off surprisingly quickly, because of inverse square, so at 840 km from Earth’s surface, then the force of gravity is 0.78, and at 340 km. is 0.9. So if you have a 500 km tether from one to the other, then tidal effects mean it keeps constant orientation towards the Earth. If you work out the orbit for the C of G, at 590 km, then using this online calculator, it’s orbital period is 1.60553 hours. So, the outer hab on the tether is going around once every 1.60553 hours in an orbit where normally it would go around every 1.69280 hours. So since the centrifugal force is proportional to the square of the velocity, the centrifugal force it experiences is 0.87 g (0.78*1.692802 / 1.60553 2) instead of the 0.78 g needed to exactly compensate for gravity, so occupants would feel an artificial g of 0.09 g. (approx) away from the Earth. Then for the innermost of the two habs at 340 km, so 6718 km from centre of Earth, then with same 1.60553 hours orbit, normally it would go around in 1.51982 hours, so the centrifugal force is 0.81 (0.9*1.519822 / 1.60553 2) instead of 0.9 g, so again would experience 0.09 g (approx), this time towards the Earth. The cable is only needs to hold itself under 9% of Earth gravity, so can be lightweight (only 1.275 metric tons for 500 km) and made of ordinary materials. See QuantumG's blog post, Non Rotating Artificial Gravity. That might be especially useful if it turns out that 9% of Earth's gravity is enough for reasonably good health (of course nobody knows the answer to this yet). This is not far off lunar gravity, though that's more like 16% of Earth's so would need a slightly longer tether. If the tether could be long enough, then could go up to nearly half g. I make it that to get Mars gravity by this method you need a tether of about 10,000 k which would take it well above geostationary orbit. It's limited in application as it will only work if close to a body with reasonable gravitational field. Still – would also work in orbit around Mars, Venus, with different amounts of g and depending on length of tether. If it turned out that artificial gravity of 9% of Earth's or there abouts was enough for health, can imagine someone building a 500 km tether like this at some point in the future, not so heavy at all with the Hoy tether method also safe, it is something indeed again in near future a wealthy individual or a kickstarter project could test. If it worked well for Earth, it might be used for Venus and Mars also. You would have to be very close to either the sun or Jupiter however for it to make much of a difference, indeed would need to orbit inside of the Jupiter gravity (if I got it right) to achieve lunar g.
If you used the same length tether, and same spin rate, in free space, without any planets nearby - then you have a 500 km tether rotating once every 1.60553 hours means, radius of 250 km, and 0.0267588 rpm. Using SpinCalc that gives you artificial gravity of almost exactly 0.2 g. That's for both habitats of course, each one would experience 0.2 g.
So you get more than double the amount of gravity, if I got that right. So, if I've not made a mistake there, I see the main advantage of this spin exactly in phase with the orbit is that both habitats experience a constant amount of gravity. Normally when you get to multiple kilometer scale tethers, then you get varying gravity where the felt gravity can change quite noticeably as you spin around depending on whether you are closer to the Earth or further away from it. This time, it is just as a way to save on rocket fuel. 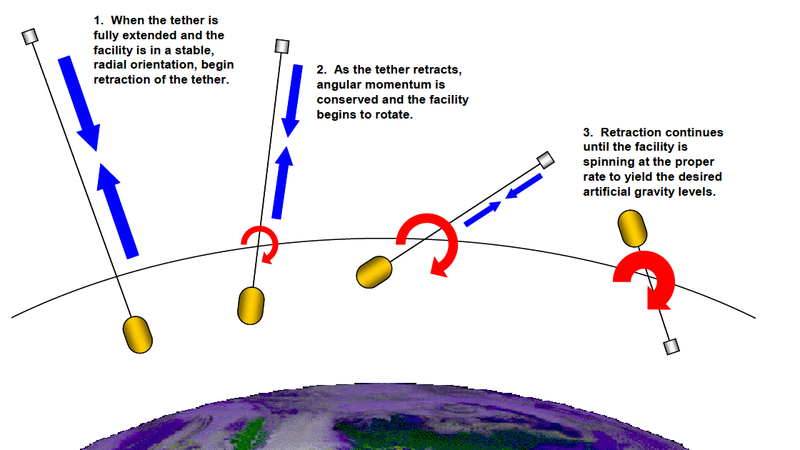 If you tether two satellites together, at different orbits, and use the gravity gradient effect, then you get a tether which spins once every orbital period. When you shorten the tether, then just as an ice skater spins faster when they pull their arms in, your tether will spin up, without using any rocket fuel. So, you pull the tether in to spin up and let it out to spin down, if you want to try lots of different AG amounts. When you want to go back to a stable position in the gravity gradient, perhaps for rendezvous with crew or supplies, you simply let the tether out to its maximum length again. Starts with with an 11 km cable, stabilize in Earth’s gravity gradient, withdraw tether to 559 m for 1g, 4 rpm – and get variable gravity in between. Space policy in the USA doesn't just depend on NASA themselves but rather on political decisions, what politicians tell them to do. This is especially true for human spaceflight. Perhaps NASA or the other government space agencies will eventually try these tether based artificial gravity experiments - especially the simpler tether experiments which seem low cost and easy to do, compared with many of the complex missions the space agencies have flown over the years. If not though, then as launch costs go down, these experiments will soon come within the reach of others outside of government agencies. Soon any wealthy individual – or other countries – or research grant based research – or even a kickstarter – could pay the few tens of millions to do the lower cost experiments using some of the SpaceX vehicles. Do you think these experiments will fly? Are they worth doing? Do we have to wait for private space flights to fly them or do you think there's a chance that the government agencies will also get interested in flying experiments in artificial gravity in space? Also do any of you know of any other ideas for tether based artificial gravity I've missed out, or got ideas of your own that you'd like to share? Also do say if you notice any mistakes, however small, or omissions. I'm always delighted to receive corrections to my articles. I can edit this right away if you spot anything. Be sure to comment below. Also don't feel you have to keep strictly to the topic of the article. I only delete obvious spam and won't delete comments if you just engage in interesting wide ranging discussions starting off from the topic of the article, as you'll see from some of the discussions on my other articles. Also do please say if you have any questions or anything here is unclear. Thanks!